Travel Size Posey Pillow 33" Diameter X 10" Height Does NOT come with beanbag fill - Must purchase fill separate and fill Posey Pillow Products Used for newborn photography only. Not a toy, seat or baby bed! DO NOT LEAVE BABY UNATTENDED AT ANY TIME!! 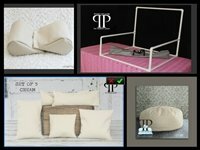 Small Size Backdrop Stand by Posey Pillow Made out of PVC pipe, (pipe does have printing on it that we can not remove) Puts together and comes apart in less then 5 min Holds blankets smooth on top of bean bag for easy editing. Fits perfectly with the Travel size Poser and TT Poser Comes with canvas carry bag with handles Squishy Poser by Posey Pillow Each piece measures aprox 10 x 10 3 Rows of snaps to adjust for baby size Does NOT come with fill Bean Bag fill with some regular pillow batting is recommended for this product. If using all bean bag fill it will require aprox 1 cubic foot of fill. Set of 5 Posey Positioners Does NOT come with rice or beanbag fill. Must purchase fill and fill your positioners. 15lbs of rice recommended for filling this item used to positioner newborns on top of your Posey Pillow or any poser Locking hidden zipper closure 3 Rectangles 1 16" X 5" 1 14" X 5" 1 13" X 8" 2 Squares 1 10" X 10" 1 8" X 8"